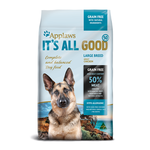 Applaws Grain Free Large Breed Dry Dog Food is a grain-free, natural, complete balanced dry food for adult dogs. While many other dry dog foods contain grains as their primary source of protein, Applaws understands that dogs are carnivores and dont digest grains easily. Applaws has designed their dog food to be grain-free, and to contain as much meat as possible to properly nourish and support a carnivores wellbeing. Chicken used is cage-free, and this food contains high levels of omega 3 and 6 oils, with natural prebiotic for digestive health. Suitable for adult dogs as a complete balanced diet. Not recommended for growing puppies or lactating females. 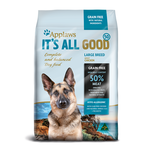 See the entire Applaws dog food range. I had purchased this in 2kg bags from the supermarket and tried the 15kg from here. While the dogs seemed to enjoy the food, in each cup I would take out of the bag there was a lot of crumbs/dust which the dogs would not eat. Great product, need it to be available more often. Love the product. not always so happy with availability of product.